Muskrat (Ondatra zibethicus) at Oxbow Nature Study Area, Feb. 26, 2015. Photo: Kelsey McCutcheon. Long, scaly tail used like a rudder when swimming. Less than two feet long from nose to tail. Muskrat, semi-aquatic rodents that are widespread and common in North American waterways, are named for their smell; they have two scent glands located at the base of their tail, and leave their “musky” scent around their dens and trails during breeding season. Muskrat have tiny front feet used for digging and holding food items, and semi-webbed hind feet for swimming. They feed mostly on plant foods, especially the stems of cattails, and have large front teeth for gnawing. A “valvular mouth” with lips that close behind the front teeth allows the muskrat to gnaw on underwater vegetation without inhaling water (Wilner, Feldhamer, Zucker and Chapman 1980). Some muskrat live in holes in riverbanks, and others build houses of vegetation. They may have different burrows for sleeping, eating and nesting, with multiple entrances located below water level. 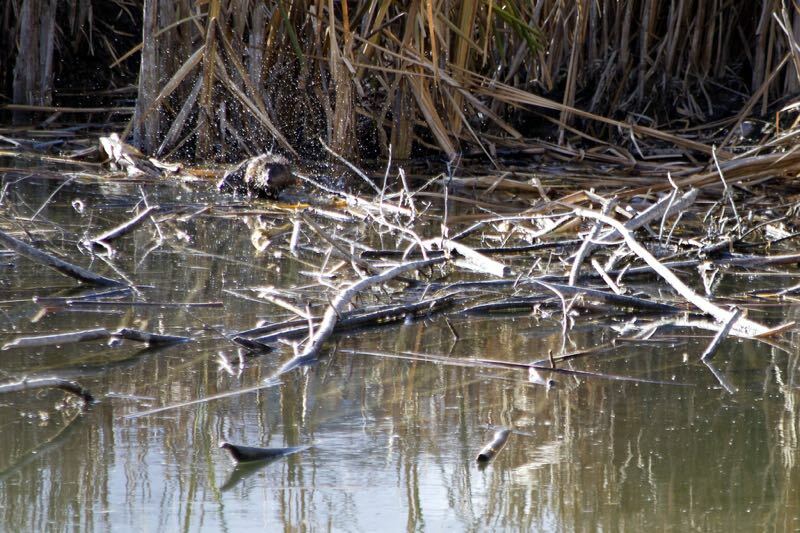 To avoid predators (including mink and raccoons), muskrat prefer habitat with water that is deep enough to dive into. They can stay underwater for up to 20 minutes (Wilner, Feldhamer, Zucker and Chapman 1980). They have litters of 4-8 (usually 6-7), and may give birth to multiple litters per year — from late spring through early fall (Wilner, Feldhamer, Zucker and Chapman 1980). Muskrat are most active at night, but can sometimes be seen during the day. Look for their tracks in the mud along the river banks. 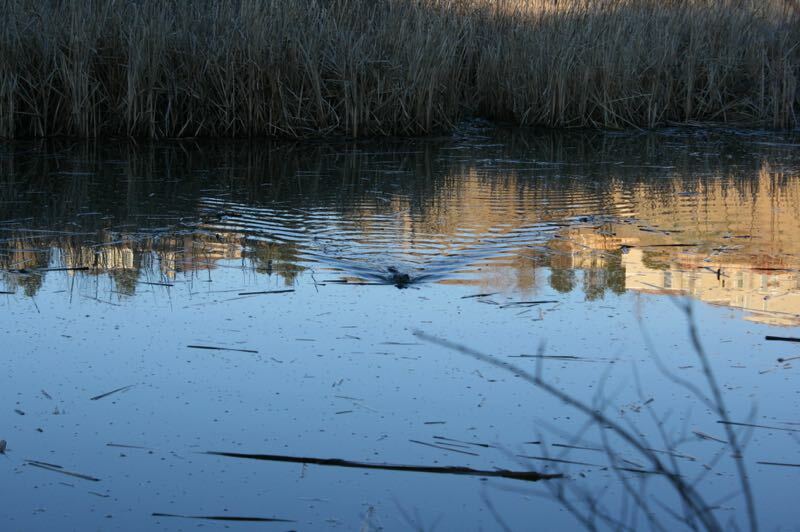 Along the Truckee, Muskrat can be seen in the pond at Oxbow Nature Study Area. If you see them somewhere else, please record an observation! A muskrat swimming across the pond at Oxbow Nature Study Area, Feb. 26, 2015. Muskrat in Oxbow pond, Nov. 2014. Photo by Patricia Bouweraerts. 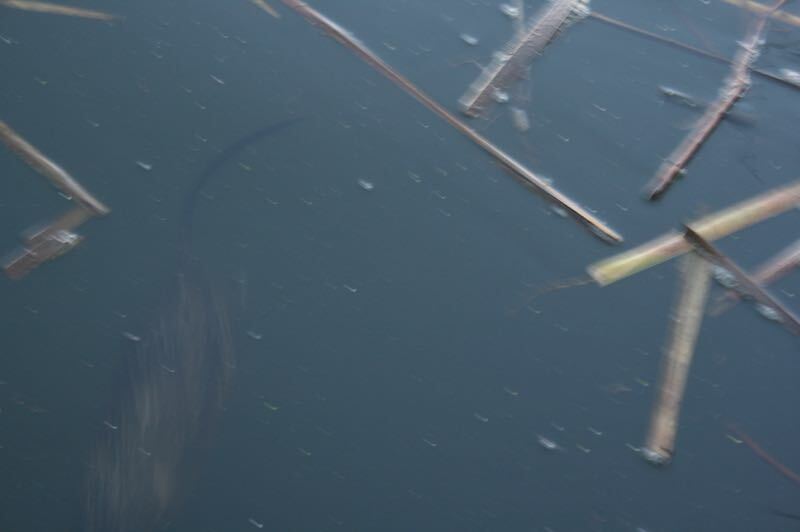 A muskrat (bottom left) swims underwater. Note its thin tail. Oxbow pond, Feb 2015. Photo: Kelsey McCutcheon. Do you have information on Truckee River Muskrat, or original photographs taken locally? If so, please contribute photos and observations here, or email information to kelseymccutcheon@gmail.com. Thanks! Orr, Robert T. 1949. Mammals of Lake Tahoe. California Academy of Sciences, San Francisco, CA.